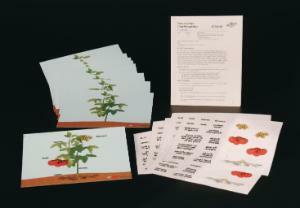 Students apply electrostatic cling plant parts and labels to a colorful laminated background card. They can manipulate the plant parts and label them by name and function. The plant parts represented are the stem, leaves, roots, flowers, and fruit. Instructions include reproducible student pages and suggestions for use for grades K–8. Developed by Christine Budnik. Set of 10.